Featuring embedded digital HDMI and DisplayPort inputs, the ASUS VK278Q 27" Widescreen LCD Monitor with integrated webcam interface enables the advanced graphic cards/computers connection. AI Light function enables the ASUS VK278Q automatically adjusting to lower brightness and make your eyes feel more comfortable in the dim environment. Furthermore, it helps save more 25% power consumption. The built-in 2.0M pixel webcam(rotatable) is easy to conduct face-to-face live conversations with family, friends or online game partners. 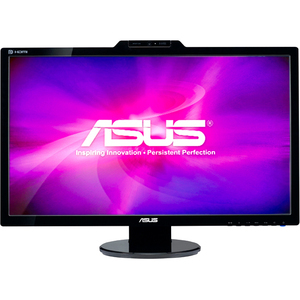 Product Description: ASUS VK278Q, LCD display, TFT, 27"